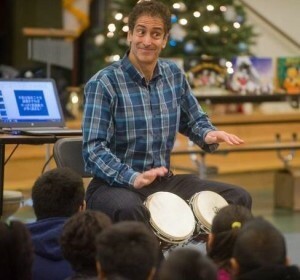 MATTHEW GOLLUB is an award-winning children’s author who combines dynamic storytelling, interactive drumming, and valuable reading and writing tips. What’s more, he does this while speaking four languages: English, Spanish, Japanese and jazz! He helps families re-discover the joy of reading to children aloud for FUN. Having visited over 1000 elementary schools around the world, Matthew’s passion is to encourage young people to read – and encourage parents to read to their kids. “Language, rhythm, color, life!” are the threads he weaves through his books and presentations while sparking the creativity inherent in young people.